A large variety of saplings of flowers will be on display and available for sale. 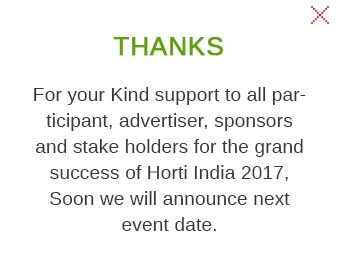 For your Kind support to all participant, advertiser, sponsors and stake holders for the grand success of Horti India 2017, Soon we will announce next event date. Knowledge about innovative technologies in Horticulture crop production like growing vegetables in soil and soilless conditions. Opportunity to reach the largest assemblage of the cross section of horticulture stakeholders.